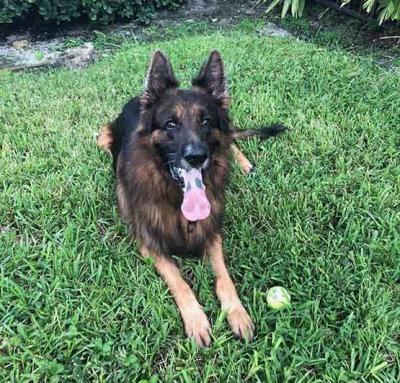 SHERMANHASAHOME - Southwest Florida German Shepherd Rescue Inc.
SHERMAN HAS A HOME SHERMAN came to us from a family neglect and basic abuse case in Jupiter FL. The family kept him on crap food and no basic medical or physical needs for 9 months while they ruined his coat and compromised his health... but surprisingly not his fabulous spirit. 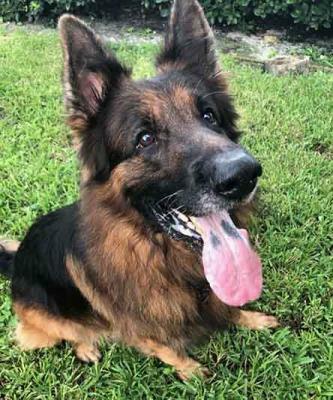 Sherman is a sweet dog and people friendly long hair red and black GSD. His is in-tact but will be given shots etc as soon as he is physically able. His coat as you can see from these pictures (NOT CURRENT) was spectacular but now it is terrible. His hair fell out from crap food and neglect. He is getting proper nutrition, love and medical care with us and will stay in foster for about 4-5 weeks until he gets to a point where we can show him for adoption. His coat and health will take a year to come back fully but it WILL COME BACK. We have had worse cases and those dogs thrived and regained their strength, health and coat after about a full year. People that do this are low life's in that they just know what they are doing and yet let it happen...once it has happened they call us to clean up their mess. Well at least they called and didn't put him down. 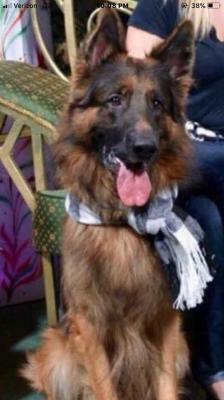 Sherman is now living with 3 other dogs and is doing very well. He is affectionate and remains loving to people even though he was so mistreated. He will weigh about 85 pounds when he is fully back and he is a big boy. The long hair ones always look bigger than they are. We do have an interested party in this dog but for now we are not showing him because of his condition. REMEMBER THESE ARE BEFORE PICTURES. HE LOOKS NOTHING LIKE THIS NOW.